A construction yard is set up alongside North Albany Road. The equipment is assembled, so this means that for thousands of North Albany commuters, a long season of construction delays and detours is about to start. The first phase of the North Albany Road reconstruction was supposed to start Monday, but I encountered no actual work other than surveying, and no delays, on that road Tuesday. On Spring Hill Drive, though, construction is under way on a roundabout at Quarry Road. 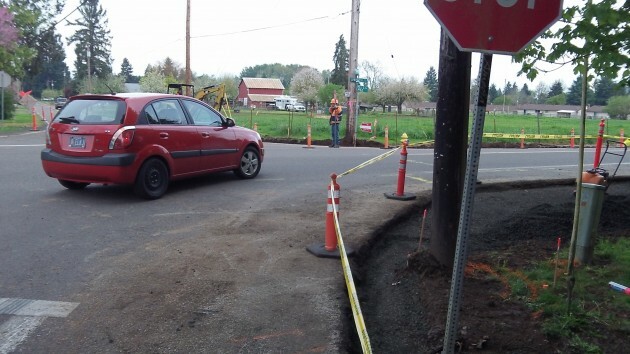 City officials hope the traffic circle will ease traffic when the intersection will have to handle much of the North Albany Road detour traffic starting about June 12. That’s when North Albany Road will be closed completely between Quarry and the railroad tracks. It won’t reopen until just before Labor Day. Roundabout (Albany’s fourth) under construction at Quarry and Spring Hill. At a meeting Monday, City Engineer Jeff Blaine (now also the public works director for engineering) reminded the city council that the North Albany Road project will affect traffic all summer. The council wanted to know if the Quarry-Spring Hill roundabout will remain temporary, as now planned, or become permanent. Benton County apparently wants it to be torn out once it’s no longer needed, the council was told. Emery & Sons Construction Co. of Salem has the $6,559,593 contract for the entire road project, which also includes completion of a water line to a reservoir on Gibson Hill. Its bid was almost half a million dollars higher than the low bid by K&E Excavating, also of Salem, but the low bidder was disqualified because the city had specified that bidders have a certain pipeline expert on staff and K&E proposed to hire one for this project instead. The first phase, starting now, covers NA Road between Gibson Hill and Quarry and includes utility, street and sidewalk work. 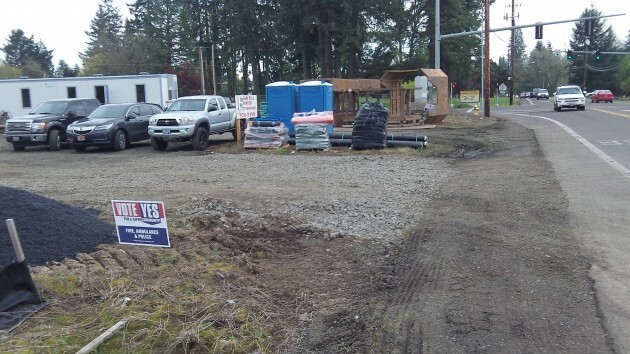 During the second phase, starting in June, the road between Quarry and the tracks will be raised and widened so it has a left-turn median, and the bridge between East and West Thornton Lakes will be replaced. West Thornton Lake Drive will be realigned to face the signal at the middle school driveway. Who IS this “certain pipeline expert”. Why isn’t another “pipeline expert” allowed? requirement and, therefore, their proposal is incomplete and considered non-responsive.